A set of statistically downscaled climate and hydrologic projections for the Pacific Northwest, implemented at a daily temporal resolution and a spatial resolution of 30 arc-seconds (~800 m2). Fine-scale climate projections stem from the CMIP3 global model archive and incorporate both statistical and dynamical downscaling approaches. Hydrologic projections were derived from reconfigured climate projections over the states of Oregon and Washington included in the PNW Hydroclimate Scenarios Project (2860). Resource managers frequently require high resolution climate and hydrologic projections to inform planning. In the Pacific Northwest, numerous resources and infrastructure are strongly dependent on the influence and seasonality of snowpack, in particular due to its influence on both summer and winter hydrology. Unfortunately, observations of snowpack are sparsely distributed across the landscape and records often too short to reliably deduce climate trends. Managers would thus benefit from reliable estimates of historical and future snowpack, implemented at fine spatial scales. This dataset combines a new 30 arc-second (~800 m2) set of climate projections with (a) simulations of snowpack covering the states of Oregon and Washington (Figure 1, left), and (b) hydrologic simulations of evapotranspiration, soil moisture, runoff, and numerous other variables over select basins in Oregon and Washington (Figure 2, right). Figure 1. Map showing the domain used for the current dataset. The region covers the U.S. portion of the Columbia River basin, along with coastal watersheds in Oregon and Washington (left). 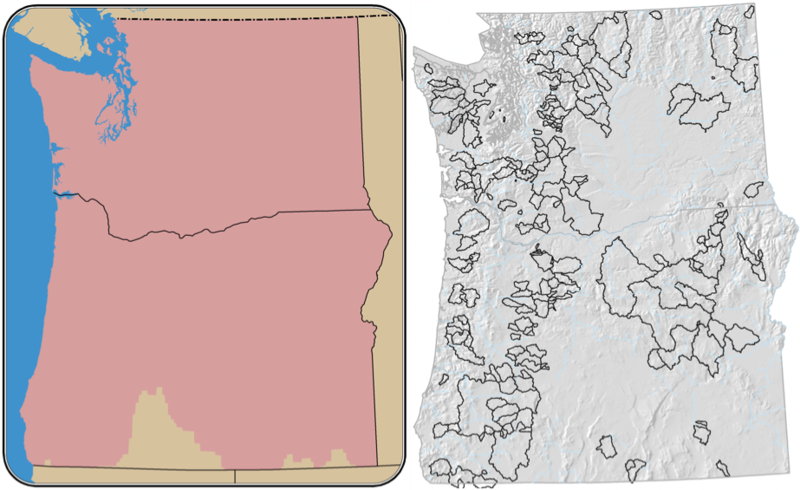 Snow simulations are confined to Oregon and Washington, and hydrologic simulations are confined to a selection of 58 small to medium sized watersheds in Oregon and Washington (right). This dataset was applied in a study undertaken by the US Forest Service and National Park Service to determine the vulnerability of infrastructure within the National Forests and Parks in the region. The assessment used the projected changes in flooding and snowpack to identify future risks to roads and trail systems. Figure 3 demonstrates the projected flooding risk at 1/16th degree resolution. Figure 4 shows the shift in snowmelt timing at the 30 arc-second resolution. The finer resolution of the new projections (Figure 4) allows park and forest managers to more accurately distinguish between areas of higher and lower risk. Figure 2. Projected change in the 100-year flood magnitude for the Cascade River Basin estimated at 1/16th degree resolution (left). Projected timing shift of snowmelt in the Cascade River Basin estimated at the 30-arc second resolution (right). Maps courtesy of Anne Braaten from the National Park Service. The domain for this study covers nearly all of the states of Oregon and Washington (see Figure 1). Monthly historical (1915-2006) and future climate data (daily maximum temperature, minimum temperature, and precipitation) were obtained by using the Paremeter Regressions on Independent Slopes Model (PRISM; Daly et al., 2002) 30 arc-second climate averages. These were then used to bias-correct the daily 1/16th degree climate records generated previously by CIG (see chapter 3 of Hamlet et al., 2010) to obtain daily climate forcings at the new 30 arc-second resolution. Due to the computational and storage limitations imposed by such a large number of grid cells, the future projections were limited to a set of three climate projections for the decade of the 2040s using the A1B greenhouse gas scenario (Nakicenovic et al., 2000). These projections were obtained from Littell et al. (2011), which used the “Modified Delta” method of downscaling applied to three different estimates of future climate: an average of the ten best-performing climate models and two bracketing runs, one from the PCM1 global climate model (which tends to be cooler than other models) and another from the MIROC 3.2 model (which tends to be warmer). Hydrologic simulations were implemented using a modified version of the Variable Infiltration Capacity (VIC, Gao et al. 2010, Liang et al., 1994) macroscale model. Specifically, VIC was modified to include terrain slope and aspect in radiative calculations. With the exception of a few climate variables included in the soil files, which were taken directly from the 30 arc-second dataset, the daily wind data and vegetation and soil parameter files were obtained by linearly interpolating the values from the 1/16th degree files used in the Columbia Basin Climate Change Scenarios Project (CBCCSP, Hamlet et al., 2010). Finally, the snowband parameter file was generated to include a maximum of five subgrid elevation bands in each grid cell, defined based on a 2 arc-second (~60 m) resolution Digital Elevation Model (DEM). This latter file is particularly important for the present work, since it specifies the sub-grid elevation bands on which snow calculations are performed for each grid cell. Simulations of snow water equivalent (SWE) were obtained for the entire states of Oregon and Washington. Additional hydrologic variables, following those defined in Chapter 8 of Hamlet et al. (2010), were obtained for the 58 study basins identified in Figure 3. Monthly summaries and annual statistics of SWE are archived for the historical and future simulations and made available for download. Specifically, the value of SWE is stored for the first day of each month for each grid cell in the simulation. In addition, a number of annual statistics are calculated (e.g., maximum swe, date of 10% accumulation, etc.). Summaries of the simulations are archived for the historical and future simulations. Daily results are available but not posted for download due to the size of the dataset. Contact gmauger@uw.edu for the daily results. Due to the size of the dataset, these are not posted for download. Similarly, monthly summaries and raw daily output are archived for the 21 hydrologic variables simulated over the 58 study basins. Funding for this project was provided by a grant from the USDA US Forest Service Region 6 Pacific Northwest Research Station. Kalnay E. et al., 1996: The NCEP/NCAR 40-year Reanalysis Project. Bull. Amer. Meteor. Soc., 77, 437-471. Mauger, G.S., 2010. Fine-scale climate and hydrologic projections for the Pacific Northwest. Climate Impacts Group, UW.